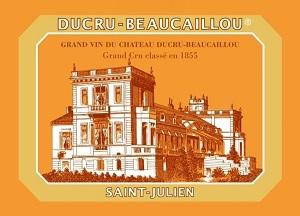 In Bruno Borie's words, the 2008 Ducru Beaucaillou is "well above 2004, with much more structure than 2007, and more sensuality than 2006." I would add that it is even better than that, and as profound as the 2005. Approximately 33% of the crop made it into Ducru, which came in at 13.1% natural alcohol. This 85% Cabernet Sauvignon and 15% Merlot blend reveals a dense opaque purple color as well as a gorgeously sweet bouquet of spring flowers, creme de cassis, blackberry liqueur, licorice, espresso roast, and spice. A testament to the density and richness of this wine is the fact that no oak is apparent in the aromas or flavors. The wine is unctuously textured, but analytically, it has a good level of total acid and sound pH. This fabulous offering will age effortlessly for 30-40+ years.Bruno Borie deserves accolades for the remarkable things he has accomplished at Ducru Beaucaillou over the last few years. 85% Cabernet Sauvignon. 90% new oak. Seven different coopers. Only 35 out of an estate total of 100ha goes into this wine now, though it used to be much more (before La Croix existed as a distinct entity).Impressive density with a pale purple rim. Aromatic and dry but with a lot of rich, velvety mass in the middle. Pretty impressive! Marginally flashy but really makes a splash. Dry finish. Very firm with lots of dry tannin. Pretty confident and savoury.. Wait! Ambitious. Very 'masculine'.